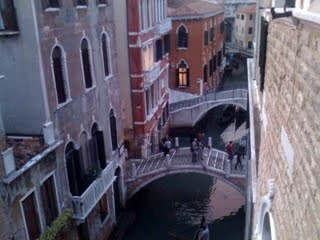 Venice!! I can’t even describe it. All the streets are like alley ways so it’s one big maze. You can litterally take a picture of everything. It’s rustic on top of old on top of rustic. Any where else run down building are off putting. 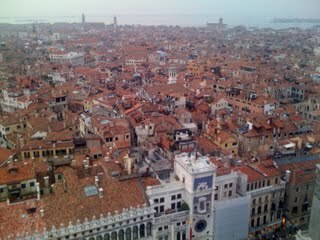 Not here, in-fact the entire city looks as if it’s tetering on colapse and it’s a gloriouse sight. Kate and I explored the city to the fullest extent in the time we had. Seeing museums churches and resturaunts all one after another. Now listen, I’m not a museum kinda guy but the Peggy Guggenheim museum was a winner. If you like modern art like we do give this one a try while your here. San Marco is of cousre a force in it’s own right. Massive amounts of space surrounded by the Doges Palace. At night the lights in every window and the haze of the city makes for a movie type setting. That and so much more has been our Venice trip. Right now we are on a train to Monterosso for some sun and relaxation. I’ve got blisters from all the walking in Venice and I’m looking forward to this part of the trip. Posted from the train!!! More in a few days!!! I might love to job interview you for my web site, you serious?